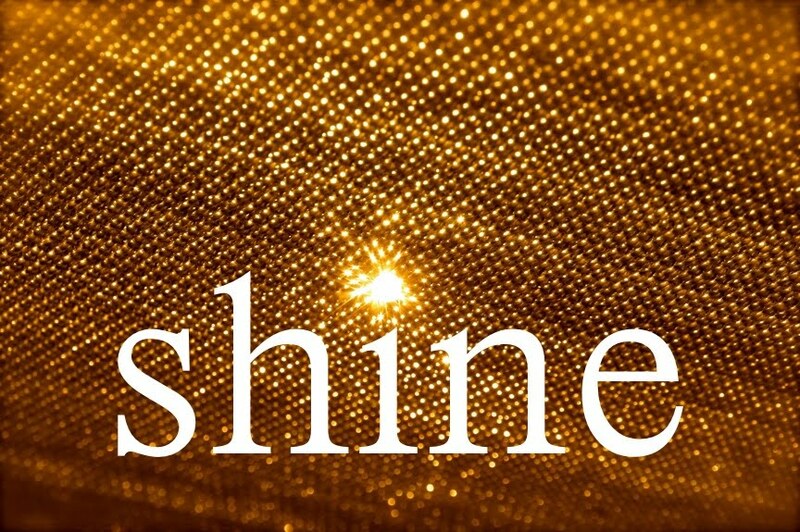 This week's word is "shine". 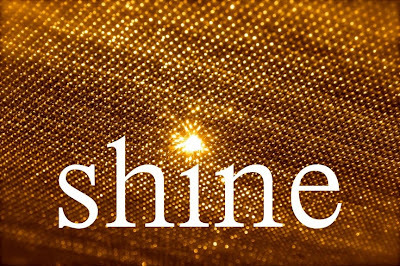 Create a piece of jewelry, a work of art, or take a picture that, in your opinion, best captures the meaning of the word. Think about the word and its different interpretations and how it makes you feel. Translate it into whatever medium you'd like and then post about it on your blog. Once you've uploaded your blog post, copy and paste the URL into a new comment on this post. Be sure to check out what others are making, inspired by the weekly word. Don't delay; you have a week until the new word is posted. One of the things that I love about the house I'm staying in is that it's filled with Allison Shock's work. Morning coffee is elevated above utilitarian purposes and transformed into a communing with art and desert creatures when sipped from one of Allison's mugs. She is a talented ceramist and thinks about all the surfaces, even the bottoms. Allison was participating in the Camelback Studio Tour and I jumped at the opportunity. Dustin and I hopped in the car yesterday and drove the two hours to Allison's studio and home of her company, Three Star Owl, in Scottsdale, Arizona. We followed the path to Allison's backyard, where she was set up. I was instantly impressed. Around her were creatures made of clay – owls peeking from cacti, desert lizards, and sweet honey bees. The pots, bowls, and vases of varying sizes had sprouted hooves, eyes, and limbs. Some were studded with skulls. Seeing the pieces en masse was a delightful pleasure, almost akin to stepping into wonderland. On another table, Allison had a station set up where she demonstrated her hand-building techniques. One of the passerby studio tour attendees asked her if she was baking bread. She smiled patiently and described her process. While she was not baking bread and creating sustenance for the body, she was creating sustenance for the soul. Good art feeds the heart and mind. Allison's yard was a paradise of cacti and succulents. Bordering her pool was a wall of potted desert plants. Some of the pots were of her own design. I saw one skull pot in particular that made my heart race. Again, I was deeply impressed and it made me miss my own collection of succulents. She also had several feeders hung up. Birds flitted to and fro, searching out food and sharing song. Occasionally Allison would see my eyes dart, following the sound of a woodpecker or the buzz of a hummingbird and mention exactly what kind of bird it was and various interesting facts about it. For instance, a woodpecker's head is mostly made of bone and tongue. The tongue, curled up helps cushion the small brain as it pecks away and then is extended to retrieve goodies from the burrowed holes. Across the way from where she lives is a military base of some sort. A huge chain-linked fence topped with barbed wire surrounded this desert place. Most notable was the large rock formations. They had unusual holes and caves and looked like a giant anthill. Occasionally a structure could be made out and it left me wondering if the mountain itself would open up or housed secret laboratories or missile silos. It was a real pleasure seeing where she works. The day was overcast and it was moister than usual in the desert. 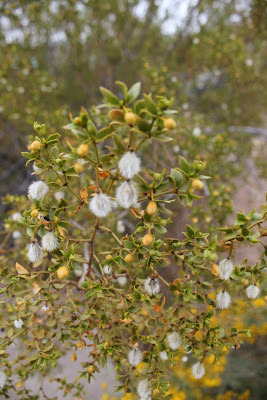 Creosote bushes scented the air sweetly, creating an intoxicating perfume. It felt almost dream-like, smelling sweet smells, and seeing a magical place where an artist creates. Expressing her love for daisies, Lisa uses scrapbooking embellishments to make a quick and cheerful bracelet! Winter white can mean bitter cold or a beautiful double strand pearl and matte glass bracelet. Art Bead Scene gets your creative juices flowing with a treasury inspired by the monthly challenge painting. Do you use buttons in your jewelry? Michelle is hosting a Button Swap. Sign up to get a partner, trade buttons, and create something! Do you use any sewing techniques in your jewelry? Come see what Cindy's sewn up! After a very busy couple of weeks, Lorelei finally has time to share some pictures from a recent trip to Spain! Come and see what the amazing Kim Miles has been up to as Winter turns to Spring--You will love it! Inspired by the poet Rumi and a gorgeous pendant from Green Girl Studios, Charlene creates a necklace using beads, fiber, a button - and of course - the pendant. Want to win some FREE ImpressArt metal stamps from PJ Tool & Supply? Andrew hosts another Thursday Giveaway with a prize valued over $70! Using the focal and the clasp was mandatory, but we could use anything from our own stash to round out the rest, and choose to use the coordinating beads or not. 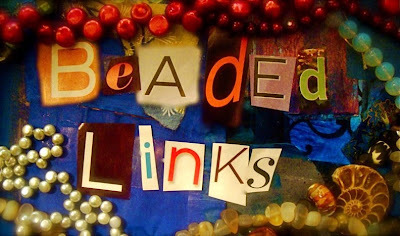 Besides being a bead swap, the Bead Soup Blog Party is meant to stimulate creativity by forcing designers to use materials that they normally would not have selected for themselves. My partner was Brenda Salzano. She's a talented mixed-media artist from the Northwest. She sent a great mix of very earthy and organic components, many of which were vintage. Brenda was really generous and sent a plentiful batch of "soup ingredients"; I felt that one of my challenges was to edit down the selection and focus on just a few of the pieces. I did add some components to the Bead Soup recipe. I wanted to bring the greenish blue color up, but also wanted the scale to be more dainty, so I substituted Vietnamese ceramic rounds instead of the more chunky aventurine cubes. I also wanted to bring the red, blue, green combination up into the piece and incorporated enameled headpins from Objects & Elements, Swarovski crystal pearls from Fusion Beads, and enameled bead caps from C-Koop Beads.